Background: To correlate PSA levels with prostatic lesions and grade of Prostatic adenocarcinoma Methods: The study includes male patients with lower urinary tract complaints, advised to get their PSA levels and Transrectal ultrasound (TRUS) guided prostatic biopsy done. Study design was observational and retrospective. Universal sampling method has been used for selection, during study period May 2015 to September 2016. Ethical clearance has been obtained from Medical Ethical Committee of Saifee Hospital. We received 116 TRUS biopsies in the described time frame. The relevant data for these were collected from the hospital and departmental records. Results: Out of 116 cases, 57 cases were malignant and 59 cases were benign. Fifty-three (93%) of the malign1ant cases and 54 (91.5%) of the benign cases had PSA levels above 4 ng/ml. Thus, association of PSA level and type of lesion was found to be statistically insignificant (p >0.05). The mean PSA level was 19.67ng/ml in Grade 1 Prostatic adenocarcinoma, 10.84ng/ml in Grade 2 Prostatic adenocarcinoma, 21.07ng/ml in Grade 3 Prostatic adenocarcinoma, 39.06ng/ml in Grade 4 Prostatic adenocarcinoma and 399.26ng/ml in Grade 5 Prostatic adenocarcinoma. Thus, the mean PSA level increased as the grade increased but it was statistically not significant (p>0.05). Conclusion: Serum PSA level as tumor marker has limitations. Thus, histopathological examination is more specific for correct diagnosis in clinically suspicious cases. 1. Wadgaonkar AR, Patil AA, Mahajan SV, Yengantiwar RP. Correlation of serum prostate specific antigen level in various prostatic pathology in elderly men. Int J Basic Appl Med Sci. 2013;3:274-81. 2. Maru AM, Makwana HH, Lakum NR, Chokshi T, Agnihotri A, Trivedi N, et al. Study on correlation between prostate specific antigen and various prostatic pathology. Int J Med Sci Public Health. 2014;3:735-7. 3. Jasmin HJ, Himani BP, Bijol G, Hetal VV, Kaushik B, et al. Diagnostic Utility of Prostate Specific Antigen for Detection of Prostatic Lesions. Int J Biomed Adv Res. 2012;3(4):2–6. 4. 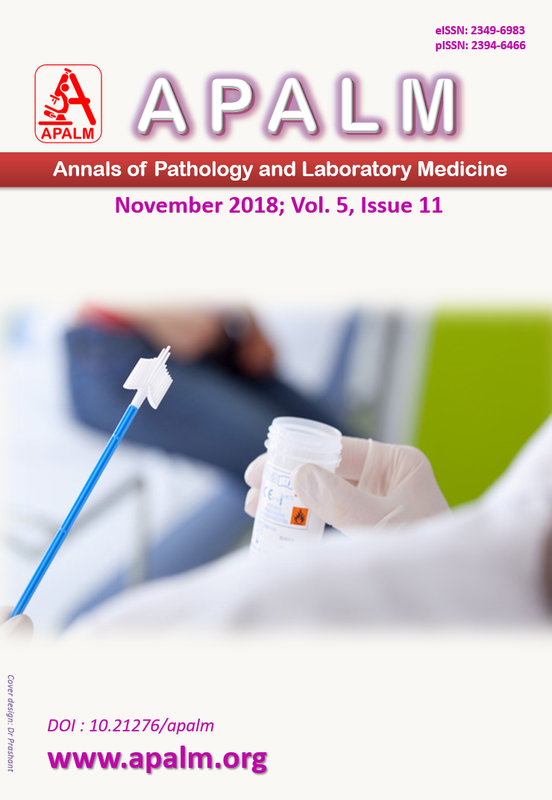 Lakhey M, Ghimire R, Shrestha R, Bhatta D. Correlation of serum free prostate-specific antigen level with histological findings in patients with prostatic disease. Kathmandu Univ Med J (KUMJ) [Internet]. 2010;8(30):158–63. 5. Lin CC, Huang WJS, Wu LJ, Chang YH, Lin ATL, Chen KK. Diagnosis of prostate cancer: Repeated transrectal prostate biopsy or transurethral resection. J Chinese Med Assoc. 2008;71(9):448–54. 6. Khant VS, Goswami H, Shah PY. Correlation of serum prostate-specific antigen level in various prostate pathology in elderly men. Journal of Medical Science and Public Health. 2017;6(2):257–61. 7. Atchyuta M, Krishna R, Latha PP, Renuka IV, Tejaswini V, Vahini G. Histological Spectrum of Prostatic Adenocarcinomas in Correlation with PSA Values. Indian Journal of Pathology and Oncology. 2016;3(March):2–7. 8. Kshitij A, Jyoti S, Agnihotri AS, et al. Utility of prostate specific antigen in different prostatic lesions,PSA assay. Pathology and laboratory medicine. Jun 2011; 3(1):18-23. 9. Haroun AA, Hadidy AS, Awwad ZM, Nimri CF, Waleed S. Utility of Free Prostate Specific Antigen Serum Level and its Related Parameters in the Diagnosis of Prostate Cancer. Saudi Journal of Kidney Diseases and Transplantation.2011;22(2):291–7. 10. Banerjee B, Iqbal B, Kumar H, Kambale T, Bavikar R. Correlation between prostate specific antigen levels and various prostatic pathologies. J Med Soc [Internet]. 2016;30(3):172. 11. Persu C, Georgescu D, Arabagiu I, Cauni V, Moldoveanu C, Geavlete P. TURP for BPH How Large is Too Large. Journal of Medicine and Life. 2010;3(4):3–7. 12. Bal MS, Kansal P, Singh H, Kaur N, Garg PK. Gleason ’ s grading in Tru-Cut biopsy specimens of prostate carcinoma. Archives of International Surgery. 2013;3(2):132–6. 13. Živković S. Correlation between prostate-specific antigen and histopathological difference of prostate carcinoma. Arch Oncol. 2004;12(3):148–51. 14. Anusha AM, Ranjith S, Annamala PT. Correlation between Prostate Specific Antigen and Acid Phosphatase with Histopathological Findings in Various Prostatic Pathologies. SSRG Int J of Medical Sciences. 2015;2(6):6–11. 15. Hingrajia NM, Desai H, Goswami HM, Gosai RN. Histopathological Study of transrectal ultrasound guided biopsies of prostate in patients with raised serum prostate specific antigen. NHL Journal of Medical Sciences. 2015;4(1):70–4. 16. Karazanashvili G, Abrahamsson AP. Prostate specific antigen and human grandular kallikrein in early detection of prostate cancer. J Urol. 2003;169:445-57. 17. Wei-Jen S, MD, Kelly G, Bonnie M, MD, Judith C, Becky W, Journal Of the National Medical Association. 1992;84:1049-1050.